Fully renovated luxury estate home only mins from St Albert. 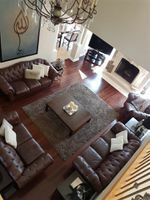 With over 7000 sq ft of living space incl professionally finished bsmt, this home was designed to impress. Soaring 2 storey entrance w/grand chandeliers highlight the curved open rise staircase. Spectacular kitchen w/beautiful granite & high end SS appliances, more custom cabinets than you could ever dream about, 2 huge islands & an adjoining breakfast nook. Main flr is complete w/magnificent great rm w/vaulted ceiling, gleaming hdwd flrs & massive fireplace, formal living rm, dining rm w/2-storey bay window & an office. Upstairs features a spacious master suite w/opulent ensuite & walk in closets, 3 more sizeable bdrms & 5 pc bath. The lower level has a large rec rm, games rm, den, 5 pc bath, 5th bdrm & superb fitness rm. This home has enough space for even the largest of families, 2 central A/C units & heated triple car garage. The backyard is a one acre entertainer's paradise to enjoy the sunny southern exposure on the wide open patio.